Evernote translation server is designed as a professional computer assisted translation tool. Its powerful and friendly translation environment is presented in so called Translate mode. To translate a string, look at the source text in English, type your translation in the translation filed and click Submit or Suggest button, depending on your permissions. Your translation will be saved in the system and you will be automatically forwarded to the next string. You can also move to the next string manually by clicking the blue button with an arrow in the right upper corner. Alternatively, you may use keyboard shortcuts Ctrl+Down and Ctrl+Up to move from one string to another. This option is only available for Windows users so far. We'll try to respond as soon as possible. To save your time and avoid mistakes, you can copy English text from the source string in translation field and then translate it. This is especially helpful if the string contains pieces of code, tags or other service elements. Click on the "Copy" icon above the translation field. English text will be copied to the translation box and the string will be marked as "Needs work". When you accomplish translating the string, uncheck "Needs work" checkbox and click Submit button. NOTE: "Needs work" is a status of a string which has a submitted translation but must be revised before getting into a product. If you don't have submit permissions, you won't see "Needs work" checkbox. Just press Suggest button and you'll be forwarded to the next string. When you accomplish editing the machine translation, uncheck "Needs work" checkbox and click Submit button. 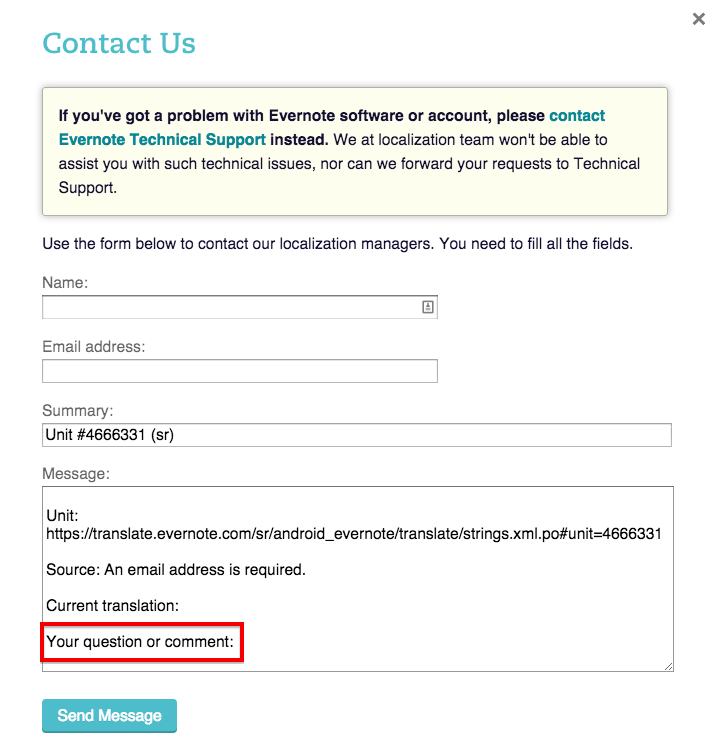 All translations you submit get instantly checked by the system for possible errors. If anything goes wrong, you see an error notification. Learn how to deal with error notifications and how to avoid the most frequent mistakes in your translations. Also, explore great professional features of Evernote translation server to make your translations even better.